This was our last full day in Tasmania and involved us having to travel from Strahan to Launceston ready to fly back to Sydney the next day. We had a lot to pack in to our last day and no wifi/signal so navigating our way around was a bit of a challenge aided by men working at the local petrol station, our lonely planet guide and whatever would load on google maps. 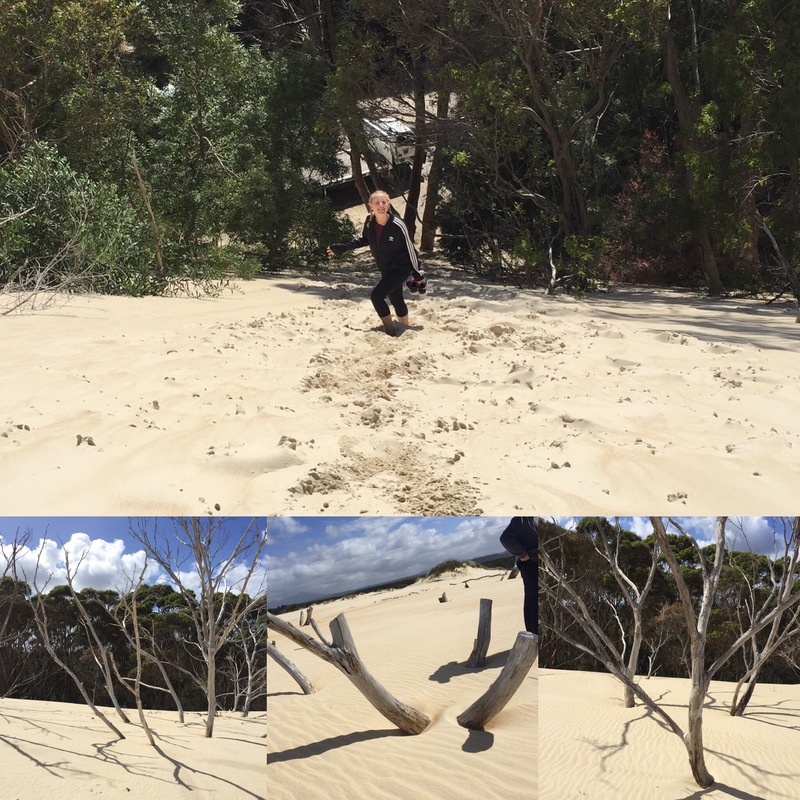 Our first stop was the Henty Dunes which are enormous sand dunes which tower to nearly the same height as the trees in the surrounding forest. We chose the most direct route to the top of these Dunes which meant clambering up a very steep side of one of the Dunes – some form or exercise though so not all bad – and it was funny trying to beat each other to the top! It was incredible when we got to the top. It was like a cold desert (it wasn’t really cold except for the wind but obviously a proper desert is boiling so I’m sure you get what I mean here). The sand went on for miles, with only the odd footprint present from ourselves or a few other people we saw on the Dunes. It was great to wander the Dunes and see them go on for so far with the sea in the distance on one side, mountains on another and then the other sides covered in the tops of trees from the surrounding forests. The trees helped you realise how high up you actually were – it was quite surreal. After de-sanding ourselves, we carried on to the Montezuma Waterfalls which is Tasmania’s largest single drop waterfall. We had met someone in the hostel the night before who had done the falls that day and told us that it was a few hours walk to the falls so we were prepared with lots of water when we arrived. The walk wasn’t challenging, it was relatively flat and the main obstacle was the puddles or muddy patches you had to avoid and the fact that it was a long way. There were also some trees that had fallen along the way and you could see more fallen trees in the distance so they obviously get some bad weather up there some times – I’m glad it wasn’t on a day we had decided to go see the falls! The track we were walking on was from an old railway that used to run through the forest. After some research I’ve found out that it was from the North East Dundas Tramway and was considered a tram because of how narrow it was meandering through the forest. The Falls themselves are named after the Montezuma Mining Company and there are some caves that are left which were from mining metals from the mountain. The walk was worth it and the falls were spectacular. The picture doesn’t do justice to how high it was and the sheer amount of water crashing down such a narrow falls was impressive. We had our lunch here and could have spent a lot longer than we did looking at the falls. The information board said that the falls are 104 metres high. There was also a bridge that you could walk across that gave you a good view of the waterfall from a far but I think we both preferred being up close to the falls to appreciate the power of the water from it. 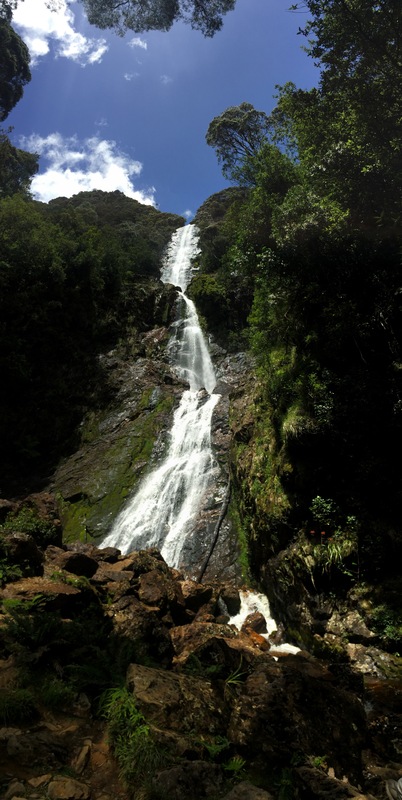 This is definitely a waterfall worth seeing if you have the time whilst in the west of Tasmania! The journey back to our car took another hour so we managed to do it an hour faster than it said it would take which we were happy about as it bought us some time for our next stop. 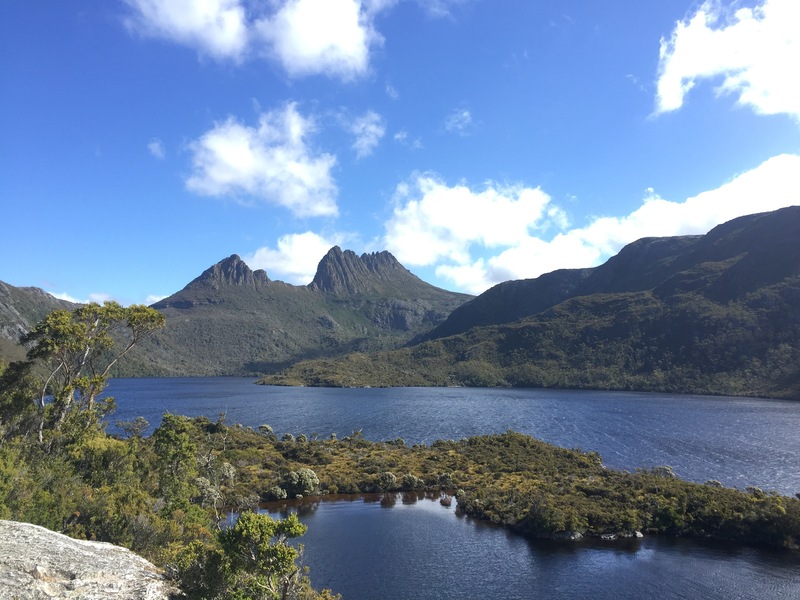 Cradle Mountain National Park was our last proper stop on our list of things to see in Tasmania. It is part of a huge national park and we hadn’t realised how big or how much time you probably needed to do it. So a side note here: if you are planning this give yourself a day to do more of the walks and explore. We parked up and got the shuttle bus to the last car park in the park (only a limited number of cars can go into the park and the roads were designed for motorbikes so are very narrow). The shuttle bus didn’t take long and was good at pointing out wildlife like echidnas and wombats along the way. The scenery as soon as we entered the park was impressive. 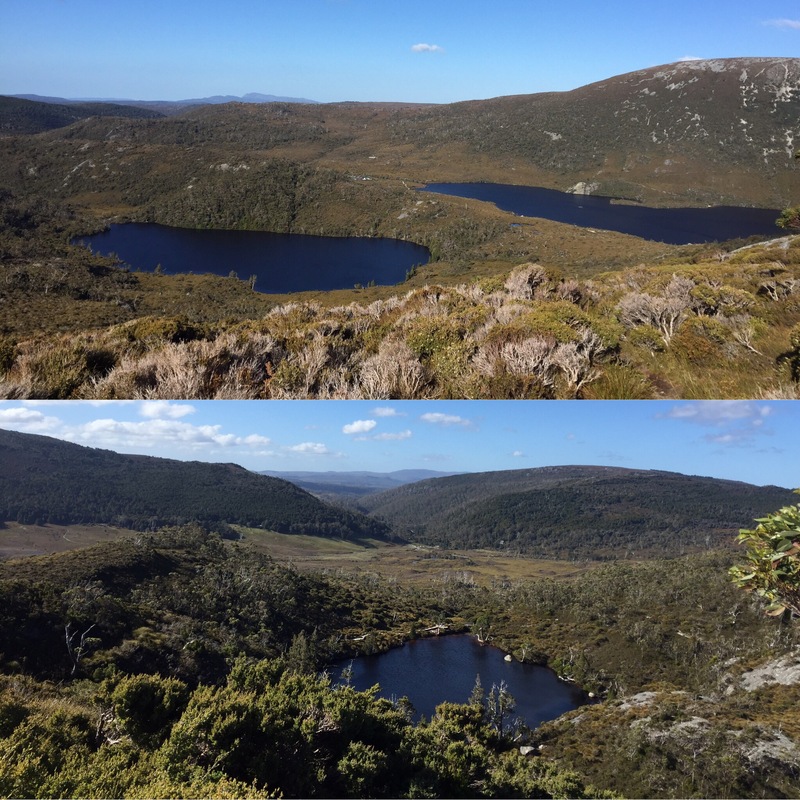 That mountain behind the lake is Cradle Mountain. The lake is called Dove Lake and is one of the biggest in the national park. We started a bit of the walk around the lake but then came back so that we could see more of the national park in the limited time we had here. Along the Dove Lake walk is Glacier Rock which, if you’re on a tight schedule like we are, gives you good views over Dove Lake without having to do the 2 hour circuit. 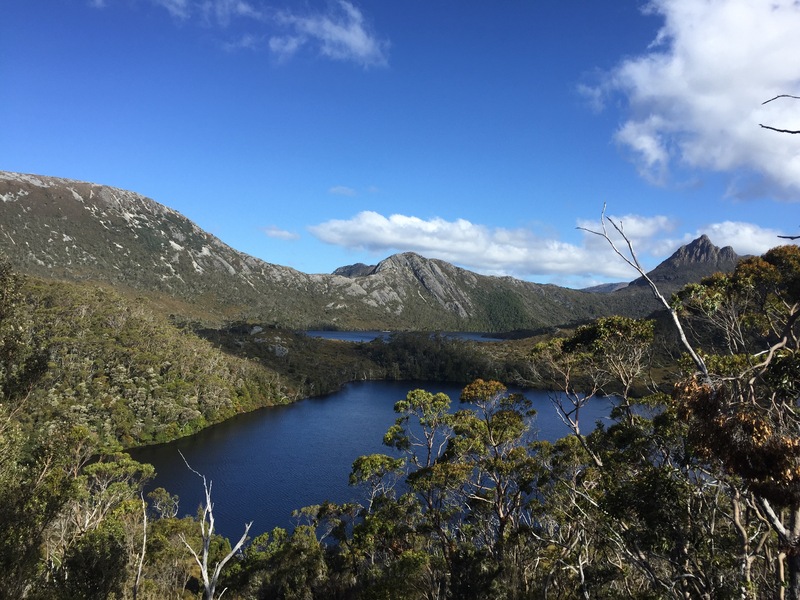 This walk is listed as one of the best to do in Tasmania so it was good to do some of it although I’m glad we turned back because the walk we did next was a lot better! Our next walk took up the rest of the 2 hours that we had left before the last bus would come at 7 to take us back to our car. We had to do it quite fast to make sure we didn’t miss the bus so it was tiring but really worth it! The walk took us up a mountain to pass Lake Lilla which is smaller than Dove Lake but very pretty set into the mountain. It was good to do a walk that would show us more of the national park when, at first, we hadn’t been sure we’d get to see much with the limited time we had. 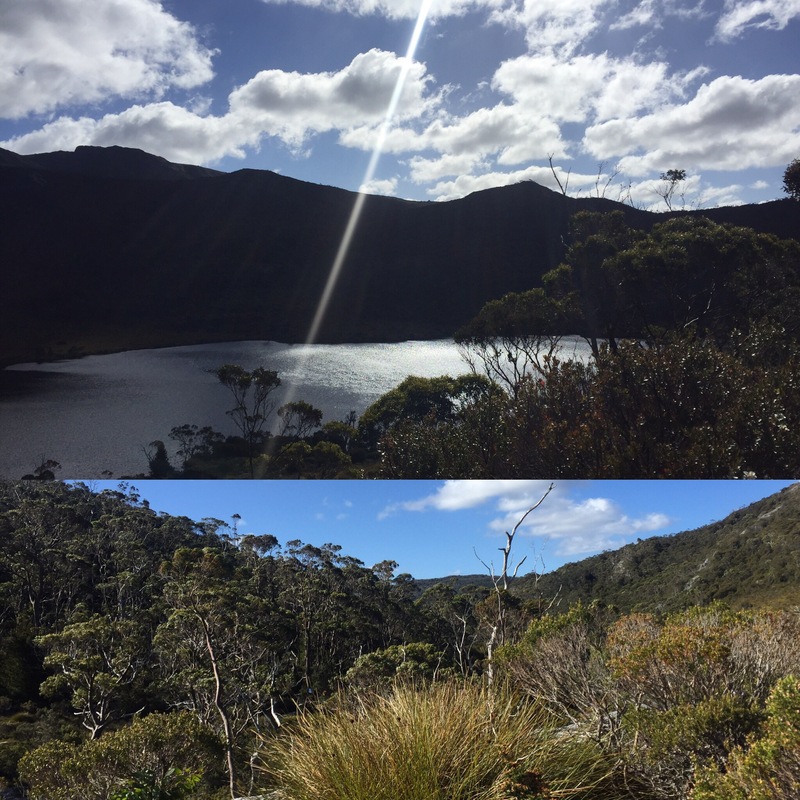 We carried on higher up the mountain – it’s a killer on your legs – to a place called Wombat Pool. This didn’t have any wombats there (maybe it’s named for its shape?!) but was a nice little stopping point – if you had time for that which we didn’t! We hadn’t been sure how much time it would leave us once we got here but we had been walking quite fast so had enough time to continue up the mountain to see what else we could see. Side note: this would be a good spot to stop for lunch if you’re there for the day because it has a cute little decking and seating looking out onto the pool. Carrying on up the mountain, although challenging, rewarded you with stunning views of the lakes we had visited so far. It was the type of view we had been hoping for so was worth the climb. One of the hardest bits about the climb was that it was quite windy and the wind was icy cold when we reached the top! We carried on even further and we were able to see Crater Lake which, as the name suggests, is in the crater of a mountain. If you had more time there is a place called Marion’s Point which is at the summit up some steep steps and would show you all three lakes at once but we didn’t have time for that. We decided to take a new route to the bus as they were the same time to go back or forward and so would be ending our walk at Ronny’s Creek. This walk led us down the mountain again alongside Crater Lake meaning we got a much better look at it. The sun glistening on the water was beautiful and it looked great set into the crater. The walk was quite steep and rocky but manageable on our way down. It led us through the forest following a river which had a few small waterfalls in it and then into open moorland through Crater Valley towards Ronny’s Creek Carpark. 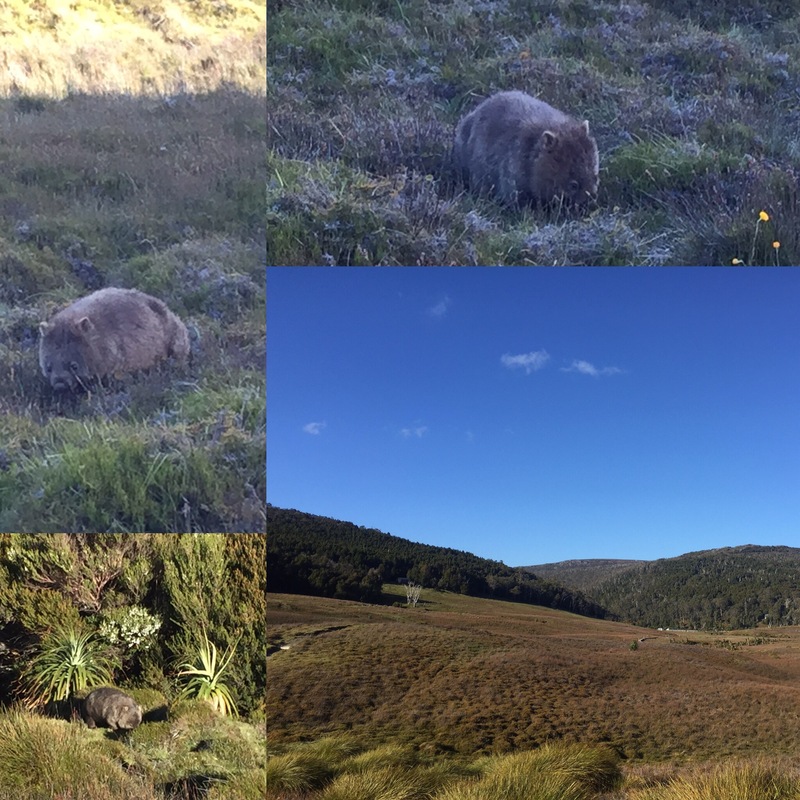 Despite getting to see a wombat from the bus down, we really wanted to see them closer up so kept an eye out while travelling through the moorlands as this is where they live. 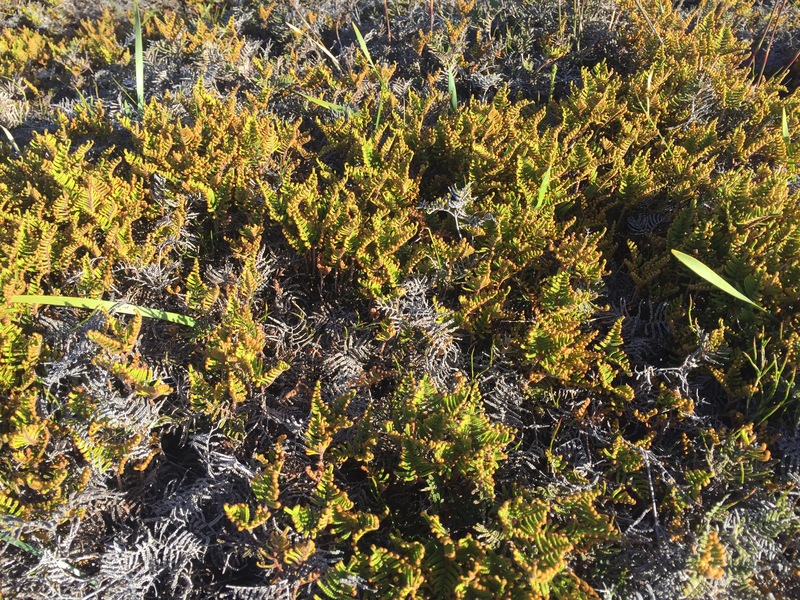 The moorland is covered in coral fern which for 5 weeks of the year has yellow spores on it. This is a wombats favourite food and will then turn them ginger if they eat too much of the spores! We really lucked out when travelling through this moorland and quickly saw a few wombats at a distance eating the ferns. They are really big and bulky which I hadn’t expected as I didn’t really know what a wombat looked like before coming to Australia. The bus driver had told us that they don’t have any predators here since the Tasmanian Tiger became extinct 50 years ago and that they are so strong that if a Tasmanian Devil or fox (which aren’t in Tasmania but are on the mainland) tried to go into its burrow to eat its young, they have the power to crush it with its arms against the sides of their burrows – not to be messed with! Wombats would normally be quite shy but these ones were really used to humans from everyone visiting the national park so weren’t phased at all when you passed them. 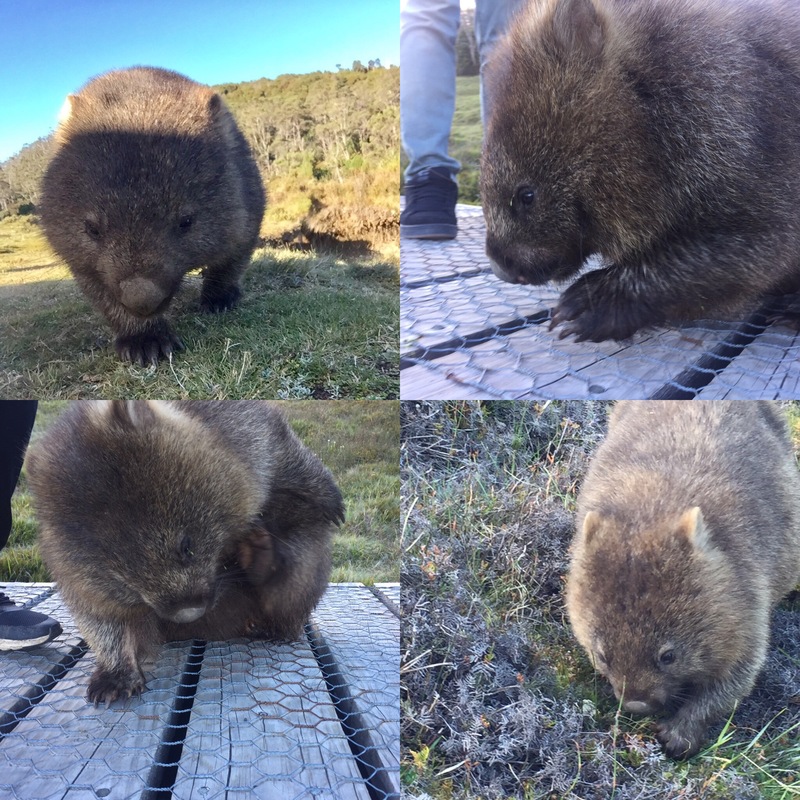 As we got nearer to the carpark (we had 10 minutes to go until the last bus came) we got a chance to see some more wombats up close which was really cool. They have such cute faces and, when one passed we gave it a stroke and their hair was all wiry. This definitely made the day that bit greater and I don’t think we’ll see wombats as good as this again! It was a couple of hours to our hostel in Launceston and we were a bit cold and hungry by the time we got back to the car. Getting warmed up wasn’t hard once the heating was on but we didn’t have any food left so we took a little detour to a town called Sheffield which is known for its many murals on the walls of its buildings. You never know if somewhere will be open in Australia, something you can rely on in the UK but thankfully a takeaway place was open and we managed to get some tea. This was really lucky because it was around 10 by the time we got back to the hostel. 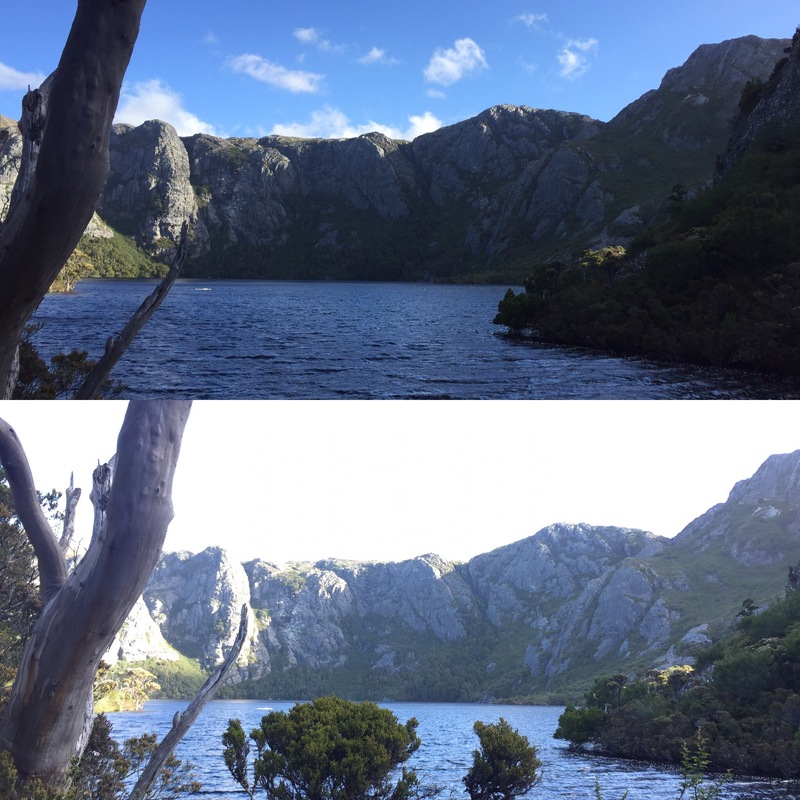 We managed to fit loads into our last full day here and even got to see everything we wanted to at Cradle Mountain National Park so it was another great day! Even though this is a long post already I’m including our last day on here as we didn’t do that much. We had to return the car at 11 and had a shuttle bus to take us to the airport booked in for 10 past 4 with out flight leaving at 20 to 8 so we had a lot of time doing nothing. 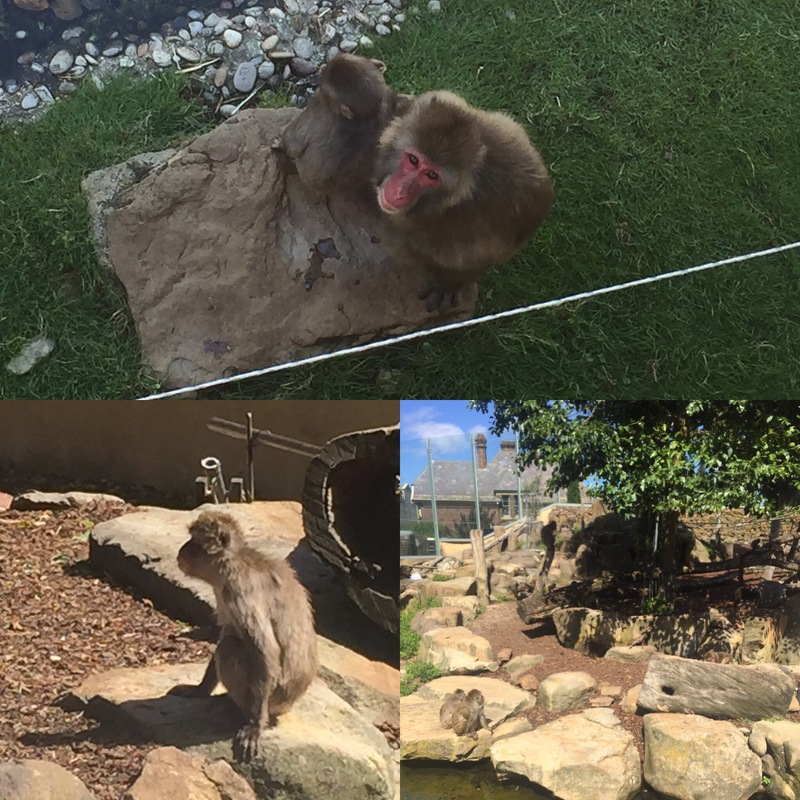 One thing we did do was visit Launceston’s City Park which is a lovely big park full of open spaces, flowers and, randomly, an enclosure full of around 20 Japanese Macaques. Apparently there has been a tradition of animal exhibitions at City Park and so, to continue the tradition, they researched the best animal to survive the climate and moved in the Macaques. We are both so pleased that we came to Tasmania and have found this island to be so beautiful with all the types of scenery you could ask for. You definitely need some sort of transport to get around but we think it is completely worth the money and would recommend this to anyone visiting Australia. 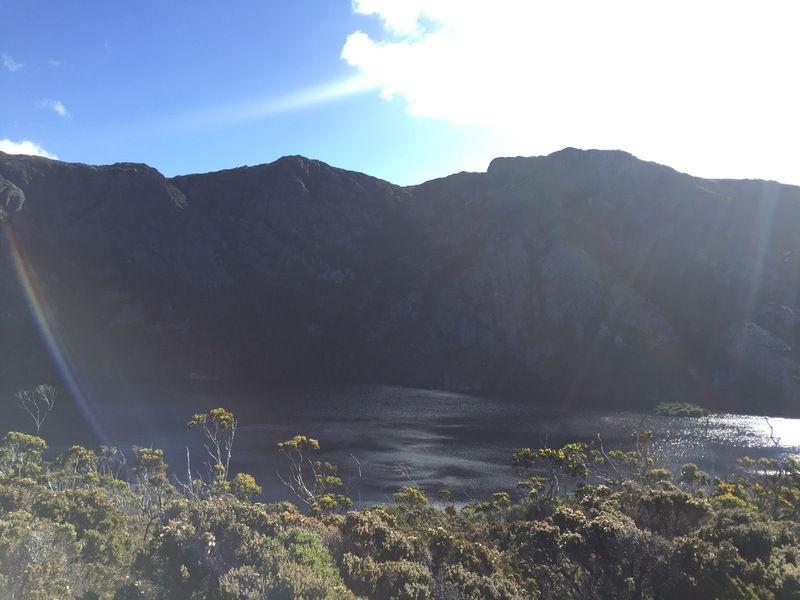 Don’t miss Tasmania out of your trip! This really is an underrated little gem of Australia!